Well down here on the island the crowds are gathering for what promises to be a steamy weekend full of sunburns, grilled food, and too much beer. Oh, and the fishing is great! 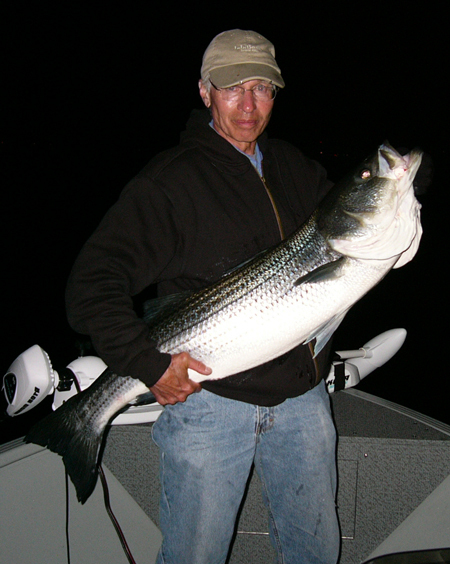 One of our most devout fishermen, Don, spent last night from 10-2am around Joppa and reports he and his boatmate Roger ended up with nearly 70 fish, including 20 keepers, mostly around 10-15 pounds. Rogers was the biggest at 43″ and estimated around 28 pounds. It was immediately released after the photo. Nice fishin boys! 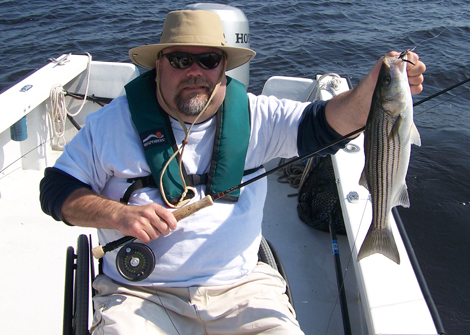 We haven’t heard of any one method working better than others this wee, so the popular standards like sluggos, chunk herring, clams and worms are all producing. 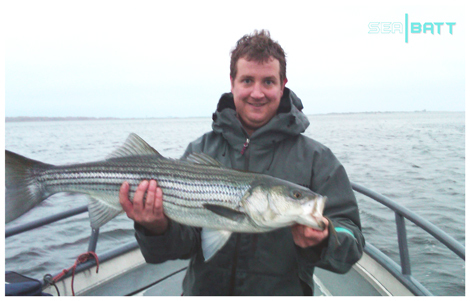 In fact, this is a really good start to the season, we like seeing the large number of small fish this year. Hopefully that means a good class of juvinile fish will grow to be large fish in a few years. 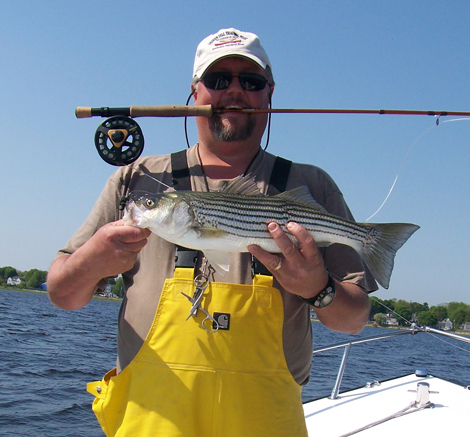 Ted Purcell writes: Two schoolies caught and released on Joppa Flats 5/26. Ted’s the guy in the wheelchair, and his flyfishing pal is Scot Wiinikka. Ted’s dad bought some of our Nate Bibaud shirts and thinks they’re cool and for a good cause. Ben Yuse, caught on poppers up river on the incoming at 6 pm. Also a 39″ on clams, 6 pm Seabrook beach high tide. 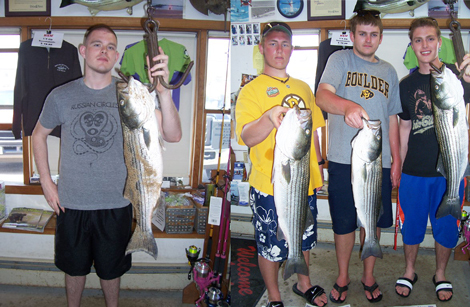 Pat McNamara writes: Fished slack low and a little of the incoming Saturday night. Caught a 24″ on my first cast at the sandbar on clams. Tried jigs and what not but no luck after the first fish. 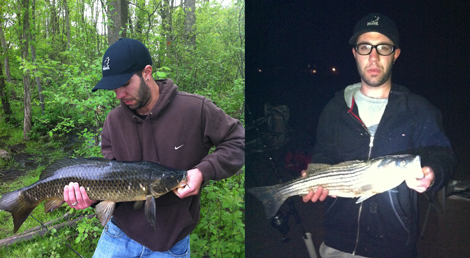 Sunday, I went to the Concord River in Billerica and caught 3 nice carp. A 15 and a 13lb Common and a 10pm Mirror. 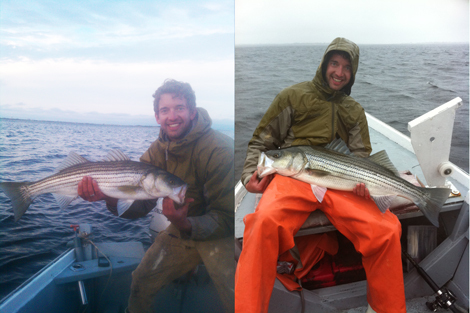 Tell Kay that I caught my first striper of the year on my first cast with the new 9′ Stellar rod she sold me on Friday! Brandon Kelly grabbed this nice one on May 24. 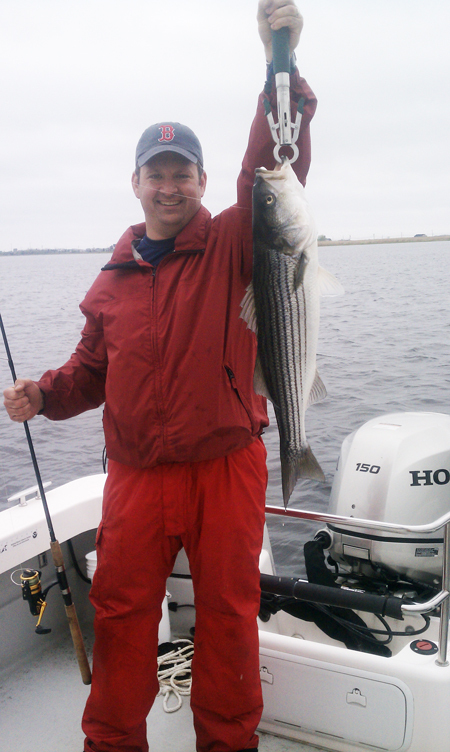 We got this one ~30 inches along with a few schoolies this morning on Joppa at the turn of the tide. White Sluggos baby! 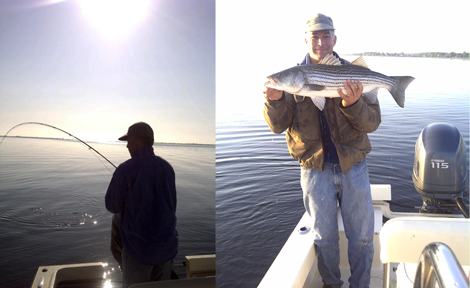 JimECow sent these flyrod bass shots in yesterday. 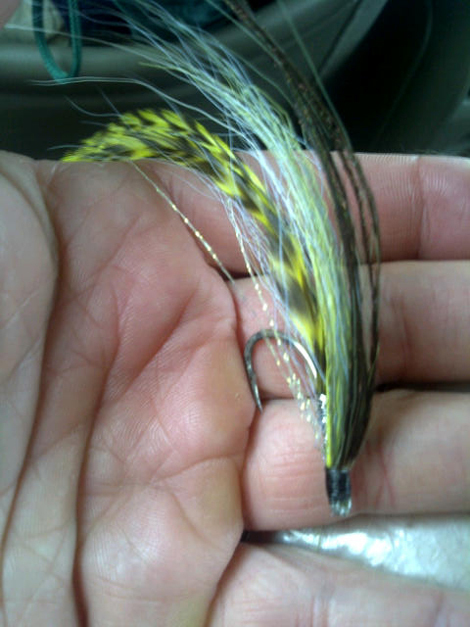 He’s out with Steve K. Olive and white clousers and mine was olive over white w/grizzly hackle and a hint of safron. Very Artful. 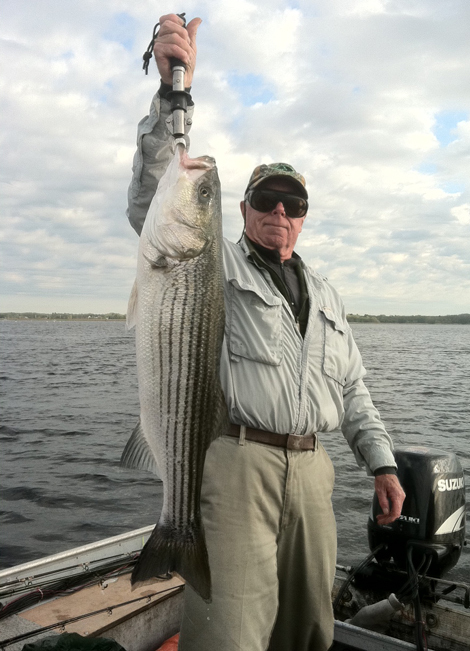 Here is a photo of my Father, Joseph Porter, of North Yarmouth Maine with his first stripper of the year caught on Joppa! He is a regular there! Fish was 34″ and 12 lbs. Caught during the first hour of Yesterday, 5.25.2011, mornings outgoing tide. 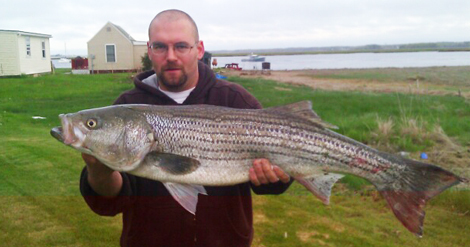 The fish was released for other anglers to tempt, as he always does. Next week I will be in for some of the shirts to support the cause! Here a a couple from some guys who’s name I don’t have handy. Nice Eating though. Awesome update Stickman – looks like there’s some fish out there. I fished the oceanfront yesterday evening in the last 2 hours of incoming. Caught a 20-er (inches not pounds) on a Storm Shad. Tight lines this weekend everyone.